Beginners to experienced Bible Journalers of all ages are welcome at our informal group. We’ll have our tub of supplies available so if you’re new to Bible journaling you can just come and try it out. We’ll be meeting on Monday, April 15 at Boneshakers Coffee (1501 Mapleton Ave) in their meeting room. Come and go as you are able from 5:30 to 7:00 pm. If you are interested but the day and time don’t work please let Gracia know! Questions? 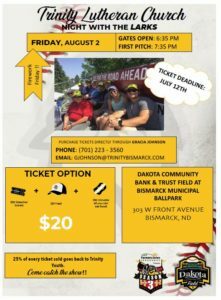 Contact Gracia at 223.3560 or gjohnson@trinitybismarck.com. Join us Monday, May 20 from 4:30 to 8 pm at Mandan Pizza Ranch for some good food and help us raise money for Trinity Youth! Pizza Ranch will donate 20% of your check back to Trinity plus whatever you choose to leave in our tip jars.